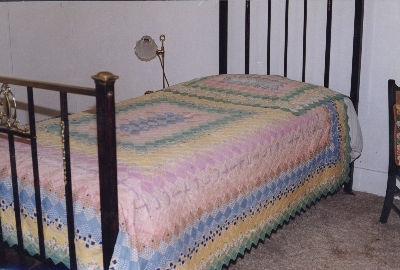 Cotton quilt with central frame and radiating borders mainly in squares in pinks and blues, printed materials and plain. The padding is cotton wool and the backing is off white cotton. The quilt was made by Alicia Florinda Tye, grandmother of the present owner, in the 1930s probably in America and Melbourne. It is still used.